Inverse Kinematic (IK) for an arm (or leg) consisting of upper arm, lower arm, and hand. The expression automatically calculates the rotation of all the arm segments such that the arm points to the desired goal point (which is represented by a null layer). You tell where the arm should point - the expression knows how. In addition you can decide whether the hand should rotate with the lower arm or preserve its orientation. If you animate an arm, for example, which is holding a plate, you probably want it to always stay in a horizontal orientation. 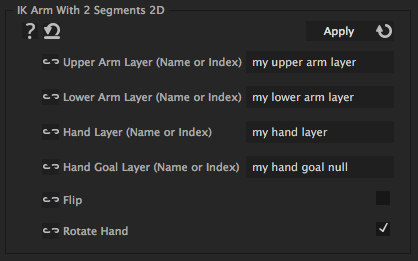 If you don't need a "hand", you can make the hand layer invisible or use a null layer for it. For the expression, the hand's anchor point is the point where the goal shoud be. where the upper arm must be the parent layer or the lower arm, and the lower arm must be the parent of the hand. In addition there must be a (null-) layer that represents the goal where the arm should point. When the arm is set up like this, all you need to do is to enter the names of the respective layers into the iExpression and apply it to the rotation of upper arm, lower arm, and hand. is the name or index of the layer containing the upper arm. is the name or index of the layer containing the lower arm. is the name or index of the layer containing the Hand. is the name or index of the null layer representing the Goal to which the hand should move. Flips the arm to the other side (there are always two alternatives for an arm to get to the goal point). Whether the hand should preserve its orientation in the plane (stay horizontal, for example). The rotation of the hand can still be modified with keyframes.